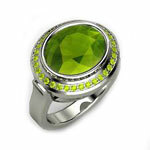 Peridot is a transparent lime or beautiful olive green stone and ranges in color from light yellow-green to the intense bright green of new grass. 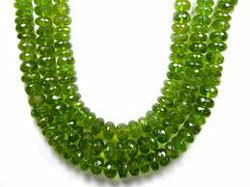 It is much less expensive than green tourmaline. 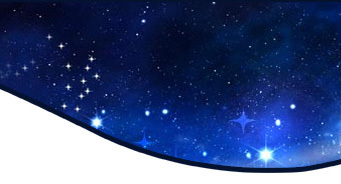 It is worn in necklaces, earrings, pendants and bracelets. Because of the way Peridot splits and bends the rays of light passing through it, it has a velvety, sleepy appearance, a shining rich glow and a slightly greasy luster. The purer green a Peridot is, the higher the value. Any tinge of brown greatly diminishes the price as well as visible flaws. Known by the ancient Egyptians as the "gem of the sun," Peridot has enjoyed a mystical reputation with its alleged powers including: warding off anxiety, enhancement of speech and success in relationships and marriage. 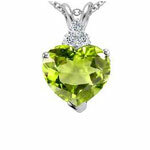 Pirates believed Peridot had the power to drive away the evil spirits, especially if set in gold. but as protection from evil spirits it must be pierced , strung on donkey hair and worn on the left arm.